TempTest® 2 smart thermometer with 360° rotating display & fixed probe. TempTest 2 smart thermometers incorporate a permanently attached hand held, stainless steel food penetration probe (Ø3.3 x 100 mm) and a 500 mm PVC lead. Incorporating a large, easy to read patented 360° rotating, digital display, it makes the ideal thermometer for both right and left-handed users. Whichever way you hold it, the display will always be the right way up! The TempTest gives a precise read-out of temperature over the range of -49.9 to 299.9°C with a 0.1 °C/°F resolution and an accuracy of ±0.4 °C (-49.9 to 199.9 °C). The thermometer will power off automatically after ten minutes, maximising battery life. This feature can be disabled if required. 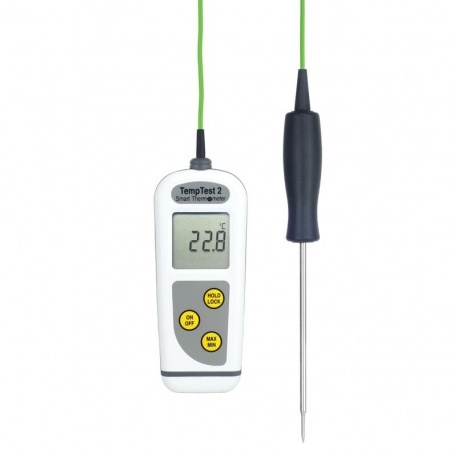 The TempTest 2 thermometer is housed in a waterproof IP67 case with an ergonomic rubber seal, both include the 'Biomaster' additive to reduce bacterial growth. As well as being waterproof, it is 'probably' one of the fastest reading contact thermometers on the market today. The true temperature of a product can be measured in just three seconds. Both low battery (icon) and open circuit indication are displayed, when applicable. Each TempTest 2 is powered by two AAA batteries with a minimum life expectancy of 5000 hours in normal use without the backlight. The backlight function features ETI Smart Technology - only coming on when the light level requires it. Each TempTest 2 thermometer is supplied with a permanently attached hand held, stainless steel food penetration probe (Ø3.3 x 100 mm) with fast response tip and a 500 mm PVC lead. choice of new probe styles available from Spring 2017! The TempTest 2 is now available with two additional probe styles; surface or air. The fast response air or gas probe is an invaluable tool in establishing the correct air temperature quickly in refrigeration units, storage areas and other similar applications. |The waterproof, ribbon surface probe is particularly useful for determining the temperature of hotplates, grills, pipework etc. Please note: the accuracy and speed response of the surface probe will be dependant on flatness of surface being measured. This strong, versatile penetration probe with a pointed, reduced tip is suitable for liquid and semi-solid insertion. This ribbon waterproof surface probe is ideal for measuring the temperature of a variety of flat surfaces, i.e. hotplates, grills, etc. This fast response air probe is ideal for measuring the air temperature in fridges, freezers, chill cabinets etc. Also available is the TempTest 1, supplied with an integral, stainless steel food penetration probe (Ø3.3 x 80 mm) with fast response tip.